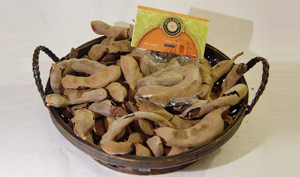 Indigenous to Africa and India, Tamarind is an important spice in many Asian and Latin American regions. It has a sweet and sour aroma, and a sour yet fruity refreshing flavor. A sweet acidulant used in many South Indian sambars, fish curries, chutneys and ransams, as well as in Latin American beverages and candies. Enhances fish, meat, poultry and vegetables. Goes well with chili peppers, legumes, shallots, vinegar, brown sugar and curry powder. Add to Thai, Chinese and Vietnamese soups.